Adds body, flavour and increased character to the beer. Designed for use with beer kits that require sugar. Convenient 1kg packet makes it really easy to use, just dissolve with the beer kit in water and you are done. 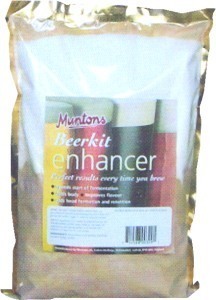 Extremely similar and a good replacement to the now discontinued Geordie Beer Kit Enhancer. Contains spay dried malt extract and spray dried Dextrose.